honigdesign: GPD check-in and some help please! GPD check-in and some help please! I'm soo excited to hear that some of you are close to finishing your Garden Party Dress. I'd love to see it and share your renditions here. If you would like to comment with a link to your blog or photo, I'll post it here. Or, if you don't have a blog, email me at designhonig[at]gmail[dot]com. Can't wait to see! In other news, I wanted to share with you my latest lunch break, low-blood-sugar-induced, impulse purchase. You're not seeing things. 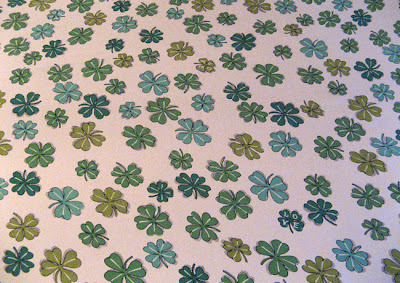 That's nearly 2m of clover printed silk. I think the moment I actually put my hand in my purse was when I saw the word LOVE printed in one of the clovers. And this one wasn't even from the remnant bin! 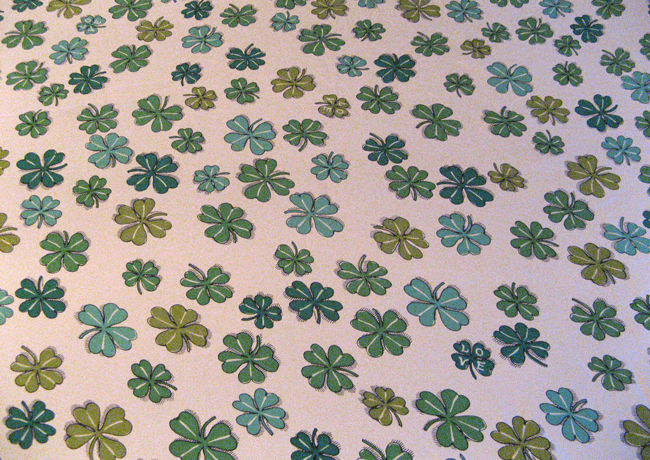 I skipped backed to work like I'd just found a pot of gold, but the horror really set in when I got home and realised I had 2 metres of clover printed silk! I actually think that will look nice if the print is as small as it looks in that photo. 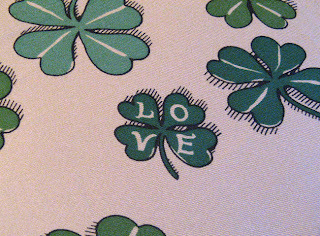 I really like that print, but would have panicked myself when I got it home because it is a clover print. Those prints look really cool when made up though. Trench coat/ over coat/ jacket lining. Or if you really want it well hidden, formal pants lining XD If it's quite silky then shorts/ slip to wear under dresses perhaps? Short sleeves, yes yes that makes sense! Thanks! I LOVE this fabric... I would turn this into a cute summer/springdress (depending on how hot it gets in springtime where you live). I personally definitely wouldn´t hide it in the lining of anything. I also think this would make for a really cute baby-doll nightdress. But if you're not sure what to do with it, it might be best to keep it in your stash until the perfect project for this fabric comes along - and eventually it always does... Good luck with your decision! It could be a lining but what a shame if it was. The print is small, so it isn't overpowering. I think it would make a wonderful summer dress - with a whimsical feel. I like it. Thank you or the advice!! It's smallish... Maybe more medium. I hope it warms up here because I hope to wear it on Sunday! Thanks again! heheh, thanks. I ride everywhere on a scooter and love tunics so I wear silk shorts under *everything* XD It's also great for preventing tights from snagging to tunic/ dress fabric. A beautiful "Clover Garden Dress"? That River Dance thing had me in stitches!! Hope you get it done in time can't wait to see it! Who could resist silk? And with a print like that!!! Impossible! It was a logical thing to do right? Happy to have your support:) have started working on a top, here's hoping! Riverdance -- so funny! The print is so cute -- cheerful and fun. Can't wait to see your top! Thank you jean...lets just say its not the best thing I've ever sewn but it will do for one day a year!